"I will gladly dance, for those who inhabit this sad, lower world"
There will be a limited number of tickets available at the door on the day of the show. The box office will open at 6pm. As part of the 125th Anniversary of the Consulate-General of Japan in Vancouver, the Consulate and TomoeArts, in cooperation with the Komparu School of Noh, will present a full performance of the Japanese noh drama Hagoromo (The Feathered Robe). Led by internationally acclaimed noh actor YAMAI Tsunao, a troupe of 11 performers and musicians from Japan will come to Vancouver to perform this play with gorgeous brocaded kimono, hand-carved masks and traditional chant and drumming. The story of Hagoromo (The Feathered Robe) tells of an angel who descends to earth from her home in the heavens. As she is bathing, a fisherman named Hakuryô steals her feathered robe from the pine tree it hangs on, taking away her ability to fly. She begins to die for longing to return to the sky, and begs Hakuryô to return her robe, but he will only do so if she shows him the dances of the heavens. She promises to dance, insisting he return her robe first. He refuses, saying that he does not trust her because she would simply fly away without dancing. The angel then shames him with the most famous passage in the play,"No, no, suspicion is only for humans. In Heaven, deceit is unknown." Hakuryô returns her feathered robe and she dances her way to her celestial home. 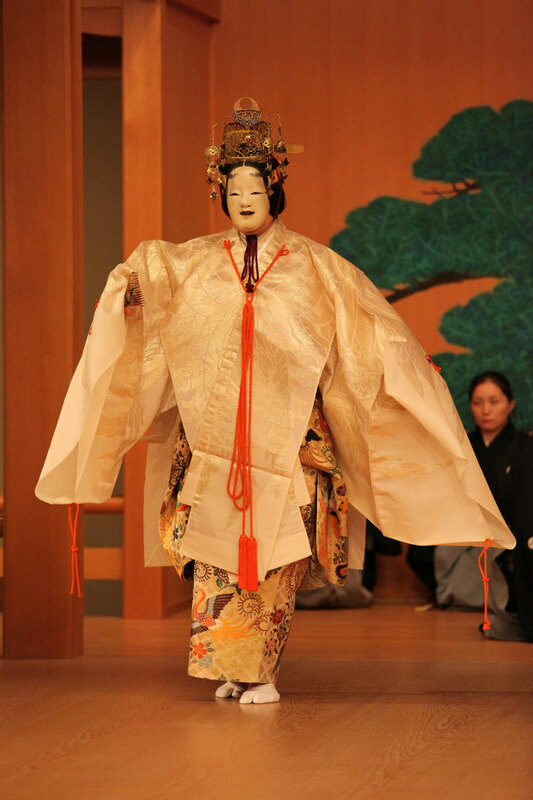 Also in the evening's performance, KOMPARU Norikazu the next head of the Komparu School of noh, will perform an excerpt of chanted music from Okina, the oldest and most sacred play in the classical noh repertoire. General admission. House opens at 6:30. Performance runs approximately 80 minutes without an intermission. Pay parking available off Cordova Street.